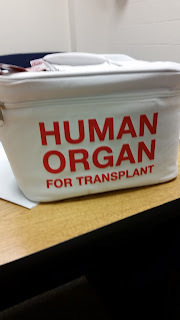 When I was going through chemotherapy, one of my friends gave me this lunchbox. She wanted me to laugh a bit, and I did. Unfortunately, this sort of lunch box really isn't appropriate for the elementary school crowd, where I was working last year. It is perfect for the middle schoolers, my current campus. Those kids haven't batted an eye when they see me walking down the hall with my lunch box swinging jauntily. Then again, most of these kids watch shows featuring zombies, vampires, and other supernatural creatures. What's a lunch box to them? 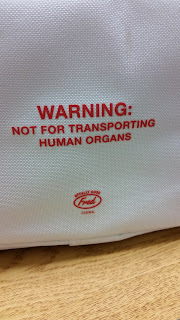 However, the other day after I'd eaten my lunch I noticed a few words written on the bottom of my lunchbox. 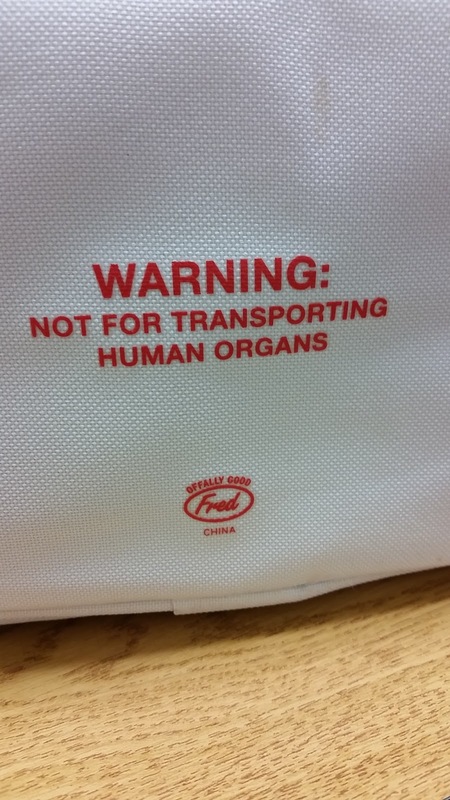 A warning about NOT using this particular lunchbox to actually carry human organs. Usually when they put a warning on something, it's because someone either asked a question about it, or someone actually DID it. I sat there a few minutes, digesting my food, and thinking of the kind of person who would take the words on this lunchbox literally. The kind of person that would necessitate such a specific warning. I don't know if I want to ever meet this person. lol, that is a good observation. No, you do NOT want to meet that person. Thank you for sharing your experience with us. It is really funny. I think you must meet the person. Normally no one will take such lunchbox.